Invoice many hundreds of clients in just a day: Mill7 is made for trust offices. Invoice fixed fees, time and disbursements. 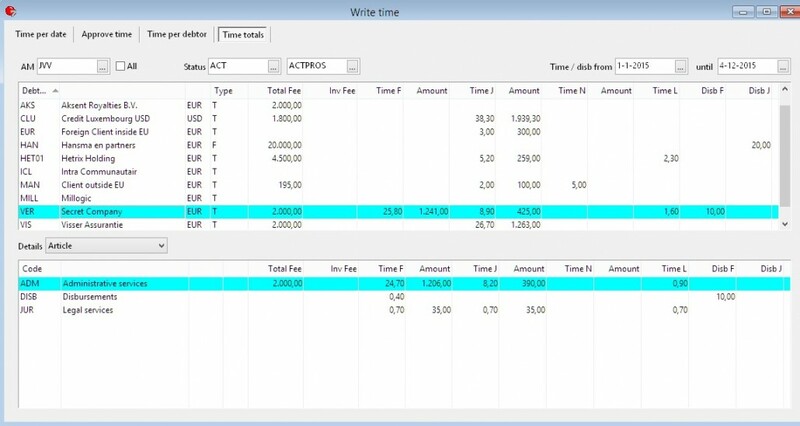 Setup clients with specific time rates, a specific time specification layout or a specific surcharge. Trust offices need flexibility. After sending an invoice it is easy to make corrections. A credit invoice is made in seconds, credit invoices can be rebilled after corrections. Rights can be set per user role: Can users change rates, can users change the draft invoice, can users approve as supervisor. Users can see outstanding invoices and easily resend the pdf invoice to the client. The approval system forces users to keep time registration updated. Supervisors can overwrite rates or adjust the chargeability of a specific invoice. Cases can be used to interact with the user to stay within budget. Compare the time spent to the fixed fees and budgets.